The annual U.S. dollar inflation rate is 7.3 percent, as of August 2017. 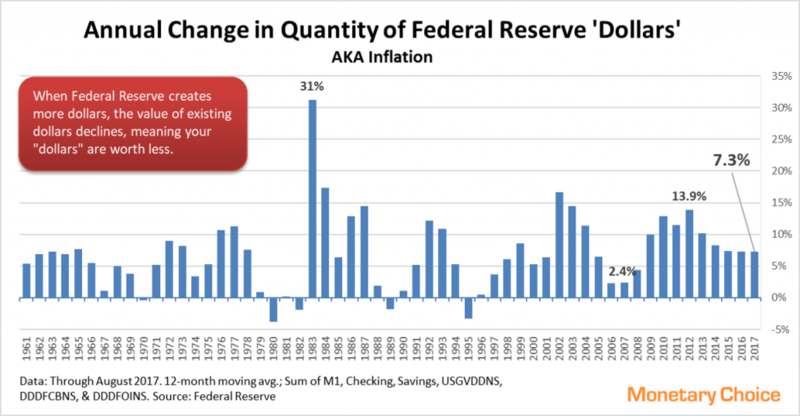 As you can see in the chart, usually Federal Reserve reduces the inflation rate after a series of high increases, but since 2014, the rate has remained level at about seven percent. Look for prices to continue to rise as the value of the Fed dollar falls. At a 7.3% rate, this means your savings and salary will be worth 7.5 percent less than they would have been had the banks not created the dollars. What should you do? (1) Ask for a raise! (2) Don’t store your wealth in dollars! Inflation affects the value of your money, whether the money is in a checking account or comes to you as earnings for work. Inflation means the increase in the quantity of dollars (though it’s mis-defined as an increase in prices). If the inflation rate is 10 percent for a year, than the value of your money will eventually be 10 percent less than it would have been if Federal Reserve banks had not issued more dollars (really promissory notes). In the rare but desired instances when the quantity of dollars decreases, that would be defined as deflation. This is also mis-reported as a negative. The banks created dollars through the so-called loan process, which is actually the banks buying securities. Most of the new dollars are created so the U.S. government can fill its budget deficit. If you look at the chart’s trend, you might be able to predict if economic activity will increase or decrease. When more dollars are available, more purchases will be made. Of course, in the background, people’s savings are worth less, so they are poorer. Some people get rich, while most people get poorer since either their savings or their salaries are worth less. Part of the value of their savings and their salaries goes to the people who received the new dollars through loans. Also, economic activity will decrease in the future. Creating “dollars” merely moves activity from the future to the present, and from savers to borrowers. It is not necessary to change the increase or decrease the quantity of dollars. The quantity can stay the same. Federal Reserve usually issues new dollars to fund government budget deficits and to help failing (mismanaged) banks and companies. Savers suffer since the value of their dollars goes towards the new dollars. Bankers and politicians prosper while savers suffer. How do you protect yourself? Hold less Federal Reserve dollars and be wary of the stock market. 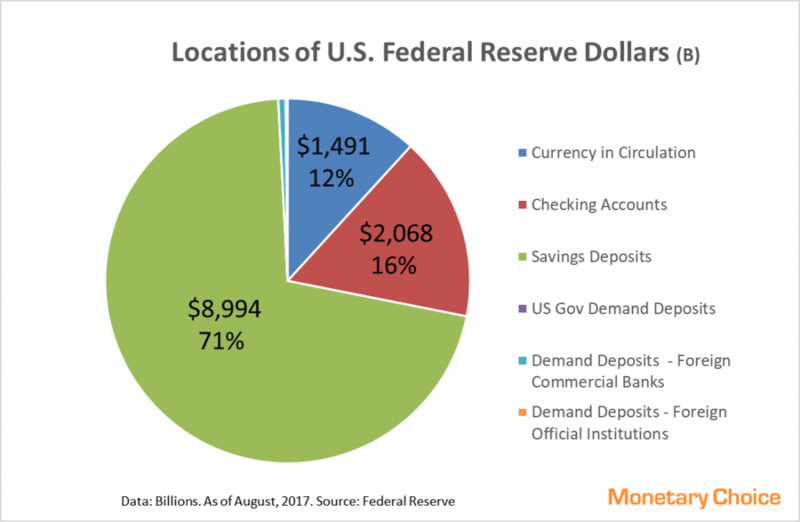 One of the most important financial elements is the number of Federal Reserve “dollars” in circulation and whether the quantity is rising or falling. Issuing new “dollars” lowers the value of existing dollars. Destroying “dollars” will increase the value of all other dollars. For example, when the total quantity doubles, the original dollars become worth half as much as they would have been if the quantity had stayed the same. The new dollars derive their value from existing dollars. Here is the current quantity of Federal Reserve Dollars. The amount of dollars doubled between 2009 and 2017. 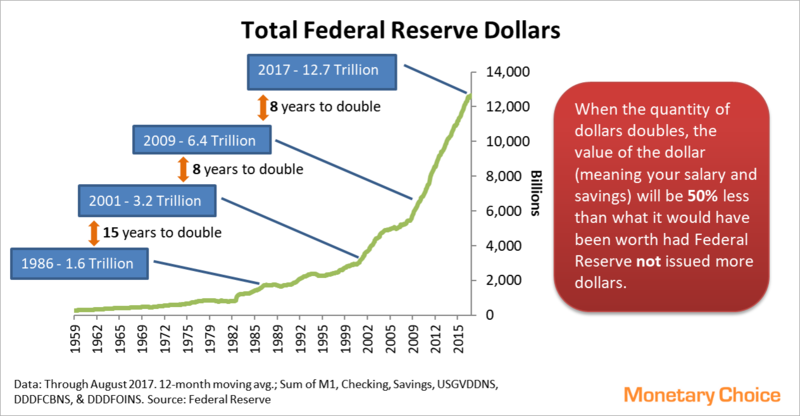 This means all the dollars in existence in 2009 are worth or will be worth half as much as they would have been had Federal Reserve not issued 6.3 trillion more dollars. Note the real cause for the new dollars is that the U.S. administration requests these dollars to fill it’s annual budget deficit. If the administration balanced its budget, many fewer dollars would be requested/created. 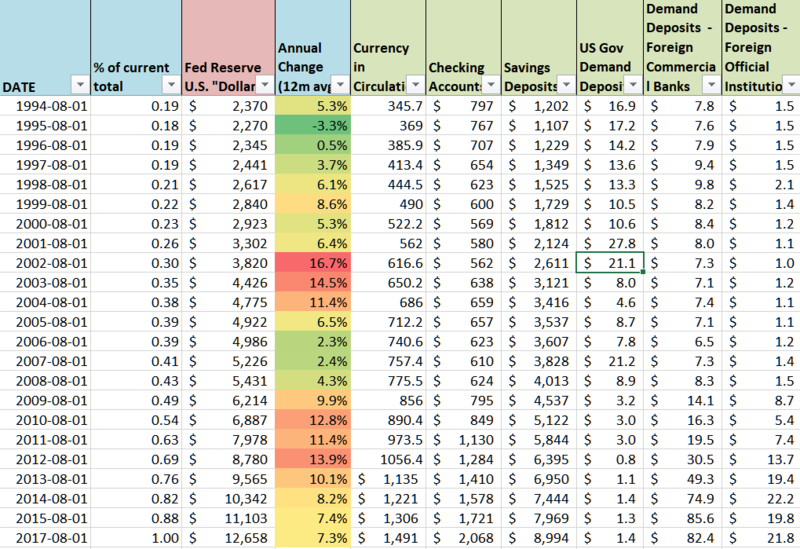 Currency in Circulation + Checking Deposits + Savings Deposits + U.S. Government Demand Deposits and Note Balances + Demand Deposits Due to Foreign Commercial Banks + Demand Deposits Due to Foreign Official Institutions. We include savings deposits because the money can be easily moved into a checking deposits from which it could be spent. As noted above, usually Federal Reserve reduces the inflation rate after a series of high increases, but since 2014, the rate has remained level at about seven percent. Look for prices to continue to rise as the value of the Fed dollar falls.